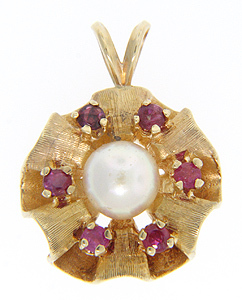 Formerly a ring, this lovely 14K yellow gold, ruby and pearl piece has been converted into a lovely pendant. 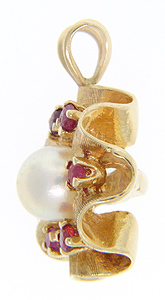 With a three dimensional wave/ribbon pattern realized in gold, the rubies literally ride the wave while the 7.5mm pearl sits calmly in the center. The vintage pendant measures 1” tall and 3/4" wide. Circa: 1945.